It’s almost game day baby! Get your party appetizers ready to serve up to your family and friend. 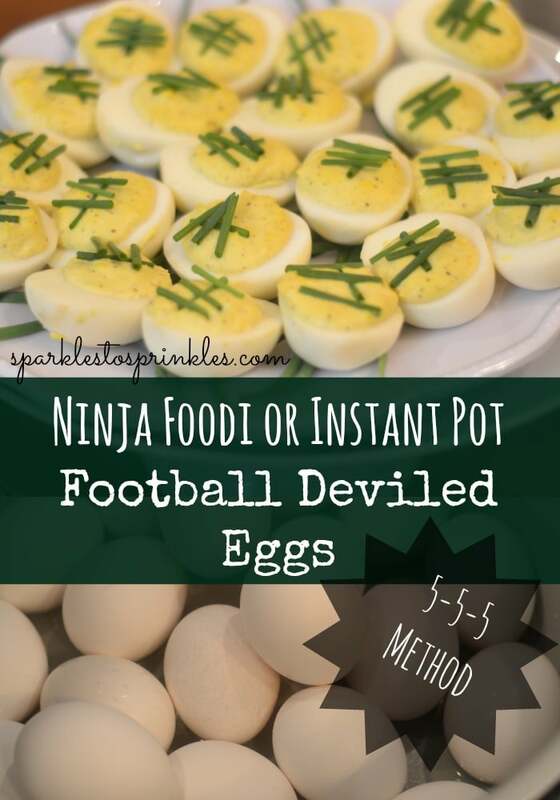 Whip up my Ninja Foodi is Instant Pot Football Deviled Eggs in a hurry! Creamy filling topped with a Football goal! I think for me eating delicious appetizers and finger foods is almost as good as the game! Am I right? Serve up tasty party food and root for your favorite team as they inch closer to winning the big game! My method for using the Ninja Foodi is the 5-5-5 method for cooking hard boiled eggs. They come out fully cooked, with a pretty cooked yolk in the center. Of course this same method works for your Instant Pot. The Ninja Foodi is an Air Fryer and Instant Pot in one essentially. So it is capable of both air frying and crisping up food, and cooking food fast and efficiently like the electric pressure cooker we all call the Instant Pot. If you have an Instant Pot you might of heard or seen this term used for the magical 5-5-5 method for Instant Pot hard boiled eggs. The 5-5-5 method is a simple way to know 5 minutes to come to pressure, then 5 minutes under pressure and finally 5 minutes to naturally release pressure! This method works every time and let me say is so simple to remember! No cookbook required for this portion of the recipe! The best deviled eggs recipe is this one of course! I use sweet pickle juice with Dijon mustard to give you that tangy kick with a sweet aftertone. Silky smooth filling that is topped with chives to give you that football field look! 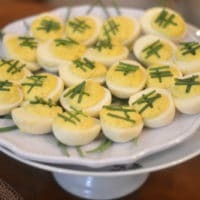 You are always welcome to skip the topping and make these deviled eggs anytime of year! 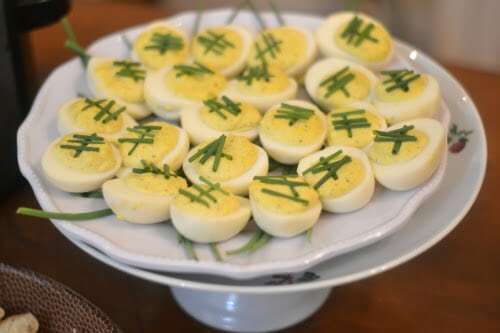 It is my go-to deviled eggs recipe. A tried and true! You can indeed make deviled eggs ahead of time! Feel free to make your deviled eggs 1-2 days ahead of time. I generally do 1 day max for best taste and texture. I would also leave off the chives topping and just place it on when getting closer to serving so it doesn’t wilt. Yes you can! This 5-5-5 method is my go to for hard boiled eggs. Cook them up, leave in shells or peel and place in an airtight container or storage bag and place in fridge until ready to do deviled eggs. I Cooked all three of these recipes; deviled eggs, crispy chicken wings, and chicken taco dip back to back in my Ninja Foodi. Because I cooked one right after the other I didn’t even have to clean my Ninja Foodi which saved me a huge amount of time! Check out my other delicious party food options! You won’t be sorry you gave this recipe a try! Make sure to try my other appetizers as well if you’re looking for the best party food for your football game! Amazingly easy to make Ninja Foodi or Instant Pot Deviled Eggs using the 5-5-5 hard boil method. Pour 1 cup of water into the cooker pot. Place eggs in the bottom of the pot. Lock the lid. Cook on high pressure for 5 minutes with a 5-minute natural release. 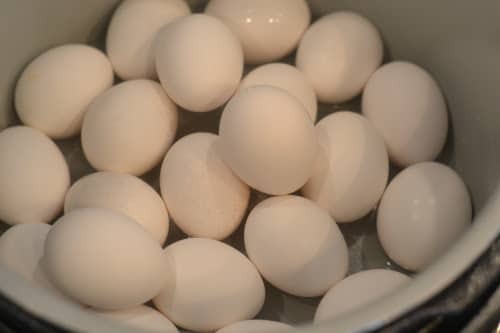 Cool the eggs in an ice bath for 5 minutes. Using food processor or mixer, mix the egg yolks, mayonnaise, pickle juice, mustard, salt and pepper until smooth. Pipe yolk mixture into each egg white. Lay small pieces of chives to recreate the laces of a football.